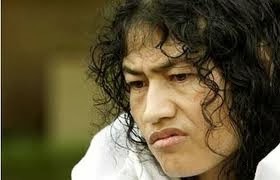 A Delhi court Thursday issued a production warrant against 'Iron lady' Irom Sharmila to appear January 30, next year in a case of attempted suicide during her fast-unto-death at Jantar Mantar here in 2006. Metropolitan Magistrate Akash Jain issued the production warrant after Sharmila failed to appear before the court. Earlier, the court had issued summons Oct 30 against her after Sharmila's counsel failed to turn up. The testimony of the prosecution witness in the case is being recorded at present. Sharmila is being detained in the security ward of a hospital in Imphal, Manipur. She has been on a fast for about 12 years, demanding the repeal of the Armed Forces Special Powers Act (AFSPA). On March 4, the court had framed charges against 40-year-old Sharmila, popularly known as 'Iron lady', for attempting to commit suicide and put her on trial after she refused to plead guilty. Sharmila was present in the court in March and had denied that she attempted suicide while fasting at Jantar Mantar here in 2006. The court had earlier told her that the maximum punishment in the case was a few months to a year, and since she had been in custody for more than six years, if she pleads guilty, the case would be settled. But Sharmila refused to accept the charges against her. Sharmila told the court that she has been protesting for the last 12 years in the "most non-violent way, like Mahatma Gandhi". She said that she is fasting for the people of Manipur, as they are being neglected by the government, and requested the court not to ask her to appear in court because of her medical condition. You're right! I completely agree with you! Our voices must be heard! Our opinions must be shared!